Brigade batsman David Murdock. Pic by PressEye Ltd.
Stuart Thompson had no hesitation in asking the Beechgrove side to bat first on winning the toss and that decision was vindicated as he picked up a couple of early wickets as Brigade slumped to 31-3 early on. An 86-run stand between Johnny Thompson and Kyle Magee steered the Waterside men out of trouble - Thompson making 57 and Magee 25. David Murdock hit five fours and three sixes in his quick-fire 49 before skipper Andy Britton really took on the villagers’ attack. 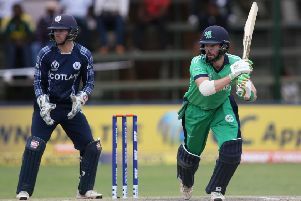 The all-rounder hit four sixes and a four in his unbeaten 50 from just 26 balls. From that scratchy start, Brigade posted an imposing 261-7. Ross Allen (2-39) was the pick of their bowling, with Thompson (2-58) and Andy Millar (2-75) the other main wicket-takers. The reply started reasonably well with Allen (19) and Andy Millar (27) putting on 46 for the first wicket. A couple of quick wickets for Mark Simpson (3-33) then had Brigade back in control before Thompson and Andy Millar fought back with a 55-run. Mike Erlank’s early dismissal coupled with the key loss of Thompson for 36 left Eglinton hanging on. 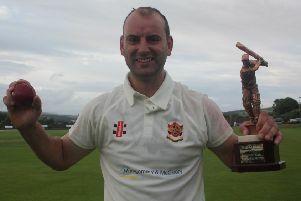 Jamie Millar battled hard with the lower order and his 64 helped narrow the deficit a touch as Eglinton closed on 171 all out - a lead of 90 for the Limavady Road side. Any thoughts of Brigade piling on the pressure were then blown away by a couple of excellent spells of bowling from Allen (2-13) and Thompson (2-16) as Brigade closed the evening on 42-4 - a lead of 132, but with 22 overs already used up. q Tomorrow sees the seventh staging of the Lagan Valley Steels Twenty20 Trophy final as Downpatrick take on Holywood at The Lawn. Full Sunday preview online at www.newsletter.co.uk.